I like chocolate and fruity flavor but the balance or light blend is preferred. Very tasty - have brewed with French press but have not yet tried the Moka Pot. It seems like it will be good for that, as well! I don't think it was my favorite. I didn't hate it, but I think it didn't like the finish the most. I think this one seemed a bit harsh. Two words, SO GOOD! Like being on vacation. I'd probably give this a 3.5 if possible. It tastes pretty good, although I question how freshly roasted the beans were. I wasn't able to find a roast date on the bag (just what appeared to be a "best by" date), and there is a noticeable lack of a bloom when I make pour-overs (even with my first cup the day after the bag was received). I could just be imagining it though. I do enjoy the flavor, but it just didn't wow me. Could definitely taste the fruit flavors in this bag. I don't typically go for that flavor, but this was good. Really enjoyed this coffee - I liked the fruitiness! thank you! Pretty middle of the road. Not bad, but nothing to rave about. A nice balanced cup, but got kind of boring and bland after the first few cups. tons of chocolate with a juicy berry finish. the fruit flavor is very nicely complementary, not overwhelming. Not my favorite. Not as good as the others I have received. Stale taste, oily texture, sour flavor. Roast was darker than I now know I prefer and tended to overwhelm the flavor of the coffee, which wasn't spectacular. I appreciated the sweetness of this one with the smooth finish. I liked this! It wasn't as robust/flavorful as Intelligentsia's but it was a good, solid well-rounded coffee. Definitely leans heavy to the medium side for a medium-light roast. Good cup of coffee, but flavors didn’t pop that much to me. This coffee is very one dimensional. Too much dark-chocolate flavor for my taste preference. It was good but kinda boring. Not as exciting as I'd like. I was underwhelmed at first and felt that the flavor was thin but a few days in I’m really enjoying this coffee. Somehow it now has a nice Cadbury egg type creamy center thing going that I find myself craving throughout the day. Very good choice again. Maybe a little too fruity for my taste, but overall still a great coffee. I'm personally not the biggest fan of chocolate notes, but this strikes a nice balance with the subtle berry flavor coming through. And I thoroughly appreciate being able to distinctly taste all the different notes in this coffee. A very smooth tasting blend. I don't know when it was roasted but it's bloom was pretty minimal. Nothing bad but nothing that really made me look forward to kit either. The aroma while brewing was rich and nutty. We loved this blend. Delicious! Enjoyed the complexity of the blend. Also had a great creamy texture. Definitley a sippable coffee. Great for the cold days of the season. The notes up front were good but the back end notes kind of fell flat. It did not feel particularly complex. Though, the caffeine was strong, you can feel it almost immediately. The flavor was very middle note, not a lot of berry or acidity and not a lot of bitter or earthy tones. Crowd pleaser over the holiday weekend but perhaps a bit too mellow in flavor for me. I'd love to try something slightly lighter in roast, either single-origin, or blend that has some brighter fruit notes. Hard to brew well, requires a bit more water to bring out more complex notes, which get smothered otherwise. Definitely got nuts and fruit from it. Thought that it was a little too chocolaty. While the roast was a little on the dark side for me, the chocolate/nuttiness came through. The cup was mostly balanced in flavor, with a slight toasty finish. Not getting the berry notes I hoped for, nor major levels of complexity. But overall, a good cup. I enjoy this coffee. Well balanced. Minimal bitterness and a very mild body. I use an aeropress. Overall, not a stunningly good coffee, but a very drinkable one. I like it, the taste is nice and mello and it's nice to drink. Really balanced and a sure great cup! This coffee taste ok. It doesn’t taste bad. In fact, if I walked into a diner and was poured this coffee I would be pleased. Unfortunately, this is not what I was looking for. If your looking for the fruitier, sweeter type of roast than this is not for you. It tastes to me like a medium roast. I don’t taste any chocolate or fruitiness, I just taste a medium bodied black coffee. This is a very mild coffee with subtle flavors. It's light and bright and would make a good dessert coffee. The berry notes are the most dominate flavors. It wasn't amazing, but it was quite good. It’s a good coffee overall, however the flavor combination was just okay to me - it wasn’t a strong flavor of raspberry but had a darker flavor because of the chocolate. I enjoy sweet coffee, however unsure about fruity per se. I would like to try coconut and I know I enjoy caramel flavors, as well as maple. I enjoy some nutty flavoring too. A fine blend that is indeed smooth and balanced, but lacks any stand out character or strong notes. Wonderful for sipping when you don't want to think about your coffee. Pairs well with a variety of food. I generally enjoy coffees with a medium light flavor, but there is something seriously wrong with the flavor of this coffee. I don't know what it is, but something does not taste right with this coffee, and it has nothing to do with the brew method. I didnt really like the fruity-ness flavor that much. Good flavor & finish. Definitely a good mid-range roast flavor characteristic. If I could give a half star, I'd say this is 3.5. It didn't quite make it to a 4 due to personal tastes. When shipped the coffee was very fresh as noted by the bloom when using my Chemex. For a medium roast (I traditionally prefer light roast) the taste was good. It was a little heavy on the chocolate notes, and not as heavy on the fruit/berry finish. While the description says a 'truffle-like finish' I would almost disagree and say it had a taste closer to dark chocolate finish instead. Loved this blend. Great in French press. I wasn't sure what to exactly expect with this blend, but I'm thoroughly impressed. The fruitiness of the coffee was a pleasant surprise, especially with such a clean finish and flavor. The blend doesn't tend to linger in the mouth and goes down smoothly, which is refreshing. A great coffee to kick off the day, for sure. I'd give it 5 stars but the best may yet to come. Very enjoyable coffee! this coffee is great right before bed or for infants. I would probably give this to anyone that likes to drink tea, maybe this will show them the light of our savior Coffee. otherwise its very light and fruity. for navy coffee just double brew and you have acceptable motor oil. My subscription is for "light" & this coffee is labeled "medium" right on the bag; no big surprise that I'm not a huge fan. Found myself thinking - damn that's delicious - on multiple cups. The stock description really says it all. The medium roast was a little too strong of a flavor for me, but other than that this coffee was ok.
Good cup for enjoying anytime of the day. Mild coffee flavor yet complex in structure. I did not quite get the fruits flavors as described, but this was certainly a well-balanced cup of coffee. This coffee tasted bland to me. I do not like chocolate undertones in coffee. It wasn't bad but it wasn't anything super memorable either. It was just okay. 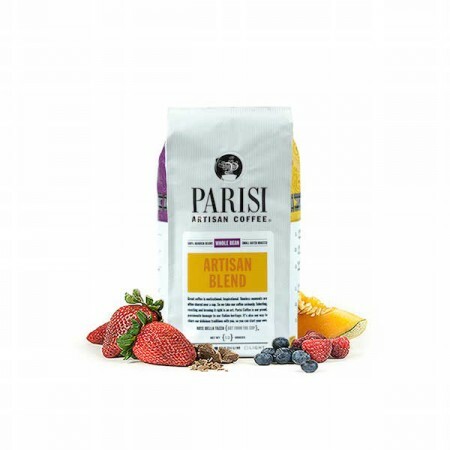 It's fitting that our first Mistobox delivery comes from Kansas City's Parisi Artisan Coffee. My wife and I just moved away from Kansas City over the summer and frequently miss the tastes of "home." Parisi had been a go-to shop for us in the beginning of our 4 years in KC. This Bravissimo Blend takes the fruity qualities of washed African beans and mixes them with the subtle complexity of traditional central american flavors. While it's not the most modern flavor profile, is an honest and trusty blend. Loved this choclatey, rich blend - a little bit heavier on the medium side for those who enjoy a lighter medium roast. I didn't like this coffee, it was too fruity and herbal for my taste. It almost has a tea-like taste to it. Glad I could try it, but it's just not for me. On a Side note, It does make a very good tasting Iced Coffee!! Love the fruity notes to this blend. Its a great fusion of chocolate notes and fruit that is both bright and complex. Excellent choice. I found it to be a little boring flavor-wise. My favorite so far despite having chocolate notes. Used an aeropress, good taste, not a full body. Smooth with some bright fruit. Mild stale notes in the aftertaste. Brewed this in a Kalita wave. It was good. I was getting more chocolate notes then fruity. As the coffee cooled the profile didn't change much as well. It's a consistent blend. Enjoyed this coffee, looking forward to trying some nuttier flavors rather than fruity. Didn't really taste any of those flavors. Kinda just tasted a bit bland/bitter. We didn't mind drinking this coffee but it seems a little bland, nothing really stands out too much about it. Wouldn't buy it again. very light flavor. Almost weak. Just started the bag and tastes great, using for cold brew. Not bitter, well balanced. I liked it, but think I would like something bolder. This blend was pretty good. Roast could be perhaps a bit darker? Somehow this coffee wasn't as rich and full bodied as I like. A little hint of tart or bitter that distracted from the overall flavor. But enjoyable. Probably wouldn't buy it over some others I've had. Perhaps it's the fruitiness - a. It like tart cherry - that I don't necessarily care for. I really like this coffee!! The first time I made it it tasted a little bitter but I readjusted my coffee/water ratio the second time and loved it. Very smooth with a little sweetness. Not normally a fan of blends but this was a great coffee - very drinkable, smooth, creamy mouth feel with chocolate notes. I like this blend a lot. It has been my favorite, so far. Love the subtle chocolate notes. Love it! Very easy cup to drink, get a lot of sweetness through my chemex. This was pretty good. Really smooth and light. Did not enjoy the mouthfeel of the coffee. Tasted like swelling butter towards the end. Not a particularly clean finish. This one is fine. Maybe a little better than the coffee from metric, but pretty unobjectionable. I found it to be pretty bitter and lacking depth/complexity in the flavor. It's okay and drinkable, but I'd never get it again. Enjoyed this blend. Needed to increase the amount of coffee I normally use in order to get the full flavor. Great smooth blend. Perfect for our taste buds! Did not have much flavor to the blend. Very mild coffee. Very smooth cup of coffee. I grinded the beans using a hand grinder and then prepared my cup using a single pour-over filter. I can smell and taste the chocolate/truffle flavors and light sweetness. The first cup I may have made slightly too strong which seemed to bring out a tiny bit of what seemed like acidity. I found that 1.75 TBS of grounds per 6 ounces of water was perfect - thus 3.5 TBS for my 12 ounce cup. Thank you for the selection. I'm looking forward to the next round! Absolutely delicious, but not as bold as I usually like. I would definitely buy this again. Seemed light for a medium roast but overall pretty good. The coffee was good, but it didn't really knock me off my socks. Perhaps I am difficult, perhaps I didn't brew it optimally. A solid coffee. I enjoyed this one a lot. The coffee was just a little week. I like my coffee taste a little bolder. I prefer a coffee taste, not fruity. Not enough flavor for me, too weak. Pretty good, with the chocolate and citrus notes really coming out when made into a cold brew. Pour over it isn't bad, but nothing special besides it being non-acidic. good flavor but a little on the light side. The whole family enjoyed this one. Nicely balanced. I prefer a darker roast but this was still pretty good. My wife and I like dark roasts that have a smoother taste - if that's possible. I did like the earthy tones of this blend. Same description as previous coffee. Balanced, good but not amazing. enjoyed the sweetness. still like the first coffee best as I felt it was the richest of the three I've received. Very sweet and fruity blend that is very versatile, I personally taste berries like acidity with a hint of smoky sweetness and an aftertaste similar to a very good cigar. I am fairly new to blends and mostly go for single origins, but now I have seen the possibilities of yet another spectrum. I have pulled this blend on chemex as well as a mocha pot and plan to send it through the siphon soon. Dificult to get the right brew. Usually too acid. The flavor on this coffee is tasty, but I keep finding myself adding more beans and making the coffee stronger, but the taste still seems a bit weak. It may be because the last coffee I recieved packed more of a punch! The flavor definitely has a sweet, fruity flavor. I might be missing the chocolate overtones. Overall a good cup of coffee. Not overly bitter. Fairly light in color. The fruitiness is okay, but I think i prefer more citrusy flavors. I liked this fairly well, though it didn't light my world on fire. Good coffee. Smooth and complex with good flavor. There was a good balance between chocolate and acidic flavors. I think I still prefer a light roast to the medium roast, but because my wife prefers dark roast, this was a perfect balance. I think I also enjoyed that the coffee was a blend because it was certainly not one note. Liked the coffee, It was a bit too fruity for me. It explains why. I dig its design tho! Very much to our liking. Coffee had the mix of chocolate and fruity flavor and still tasted like coffee. A good first coffee. Maybe slightly darker than I would like. Not too acidic or burnt. This is an extremely mild coffee - not rich at all in flavor or aroma. The flavors seemed muddled and came across bland. I tried a few different brew methods hoping one of them would make the flavors "pop", but no such luck. However, it does produce a smooth, very drinkable cup that at least doesn't taste like crap. Certainly not bad beans, but not particularly good either. Like a certain type of person we've all met - nice and pleasant, but boring and no personality. Enjoyed this coffee! Didn't get much of a fruity taste but did get some chocolate hints. Very fresh tasting and has a pleasant aroma, but I found the flavor boring. I prefer something with a stronger flavor profile. Pleasantly surprised by this one. Not a coffee I would have likely chosen myself, just based on the "Bravissimo" name. The description is right on, though, with a chocolate truffle-like smoothness, and a bit of a fruity nose &finish. The berry notes are not my favorite, when too powerful, but here they balance well in this blend. The African makes it too "earthy" for me. I don't really know coffee that well, but this has a really good balance between chocolate and fruity. Smells very fruity, but has a nice deep taste. I really liked this coffee, it was easy to drink, very smooth and started my morning off great! The reason I didn't give it 5 stars is because I would've liked have had it been a bit stronger. This coffee came off flat to me. Maybe the roast date? It was unclear on the bag. It says January then a bunch of numbers following that aren't passed days (ie 18). I did enjoy the chocolate notes though! Coffee was too mild. Tasted like flavored water. There was a hint of flavor which was enjoyable. Wish it were stronger. I asked for a darker blend next time hoping it will be better. Are all your mild blends that weak? Bit of a tart aftertaste and stronger that i expected. Better than some, not as good as i had hoped. This had a great aroma and easy palate, with nice toffee and chocolate flavors. Certainly an easy sip throughout the morning. My roommates and I found this blend very aromatic and rich. It was decadent and we look forward to more coffee with quality as high as this one! This one was pretty good a little bitter for my taste but overall had good taste notes to it. After drinking through the full bag it has become a new favorite of mine to grab from the shelf! Especially enjoyed the berry finish. I enjoyed the fruitiness of this! Unfortunately, this coffee was a major miss for me. I brewed one French Press pot, didn't finish the first cup, and probably will not return to it at all. The coffee tastes like generic coffee you get at a restaurant that hasn't decided to invest in quality beans. I'm not sure how else to identify what I disliked about it--I guess it just reminds me of diner coffee, without the nostalgia factor. I think there are too many elements in the blend and they just ended up muddled, and muddy. Really disappointed with this one. This was a pretty good coffee, but overall seemed kind of bland. We brewed this with a chemex, french press, and in a standard drip pot and actually liked the drip coffee the best. So, pretty good, pretty standard coffee, but a little bland. Loved the fruity in this!! Really great flavor and roast. Chocolate and caramel come through strongly. Tastes almost exactly like the description promised. Chocolate, fruit, balanced acidity. I like the blend of chocolate to fruit. This coffee is better balanced than the last one. I brewed this with a pour over method, ground with a Hario ceramic hand grinder. Light mouth-feel. Sweet, fruity back-end. Had the most presence on the tip of my tongue. I liked it! I'm not sure if this sounds "correct" but maybe a little less fruity and more nutty next time? In general I like coffee a little darker, but this was nice too. Mostly brewed this in a chemex. Enjoyable once I tried a coarser grind. Too dark for me though, and I typically prefer single origin. A little too fruity for our taste, and not quite dark enough! Loved the chocolate notes. It had a bit of a strange aftertaste, but overall I enjoyed it. Loved the balance! Great berry finish! not a huge fan of the fruity! This was by far our favorite coffee! An excellent cup of coffee! Damn good cup of coffee! As soon as I saw the Parisi bag, I knew we would be in for a treat! Very warm on the nose, slight brown sugar and toffee. First taste is slightly smokey with hints of hickory, but so overwhelming it ruins the cup. Not too light, but not too bold, a great all around taste! Fantastic! Super smooth, not too nutty, no bitterness. Perfect for morning or after dinner. The description of this is spot on, I used my French press on this selection and I couldn't be happier with it! Coffee had a well-rounded flavor. I am sad to say that this coffee was very disappointing. First this coffee has a very light and subtle flavor. It tasted more like hot water with a hint of coffee. Also the description says chocolate truffle like sweetness, I was unable to detect such flavors in my cup. I've had 5 cups of this coffee over the past 3 days just to make sure that it wasn't my brewing process. This coffee did not have me saying Bravissimo. Definitely on the lighter side of the roasting scale. Chocolate flavor and thin mouth feel. Beans seemed very 'dry' and when ground somewhat chalky. Amazing coffee - Loved it - Thanks! Slightly bright, tart flavor. Dark ripe berries and hints of chocolate. Nicely balanced cup. The chocolately sweetness definitely comes out, and so does a berry flavor. I think those who prefer these flavors will really enjoy this coffee. Personally I don't love chocolate flavors in coffee, or the chocolate berry combo of flavors - I tend more towards nutty flavors and caramels. This is a decent blend for sure, and I find I like it better in the morning when it's still a bit cold outside. This was our first coffee from Mistobox. With our mindset that we wanted to try different coffees from around the globe, we set up our profile with not really knowing what would show up in our mailbox. This coffee was fresh tasting, but it was just a little too mild for us. We are now updating our taste profile to check out some coffees with a little more boldness. The coffee was decent but I really do not care for flavored coffees. This is a tasty coffee but not really the type of coffee I am interested in. It is much too sweet and fruity for my taste. I have never been big into flavored or fruity coffees. I prefer a simpler bolder style coffee. Balanced, not too light. Great flavor and aromas. Exactly my style! I liked the dark, full flavor, and the slight citrus/floral taste. Thank you! Well balanced and pleasant. Chocolate flavors seem to over power the fruity flavors a bit. The coffee is excellent! I have made a couple of batches so far from a regular brewer. I had to slightly reduce the amount of coffee the bag suggested per servings as the first batch was extremely strong. I would definitely try this blend again! This beans were lighter in color than I anticipated, but the brewed coffee had more of a roasted chestnut color. There was a slightly burnt finish, but a fruity smell. I am on the fence as to whether or not I would purchase this blend again. Really 3.5 stars. Decent flavor smells like dark cherries.